What comes to your mind when you think of the U.S. Treasury? Dollar bills, am I right? That’s typically what most of us think, but the fact of the matter is that U.S. Treasury does so much more! Today I am introducing to you Ms. Melissa Koide a Senior U.S. Treasury Official, she is very personable and real. I know you will absolutely love her! A behind the scenes insider as to what we can be looking out for from the U.S. Treasury next! It's about the dedication to whatever that system is that works for you that gets you routinely thinking about your money. Have you joined us yet in our fabulous community? Wait, no? Click here to join (it’s free). What was your biggest takeaway from this episode? [00:00:25.4] JH: Hello, hello. 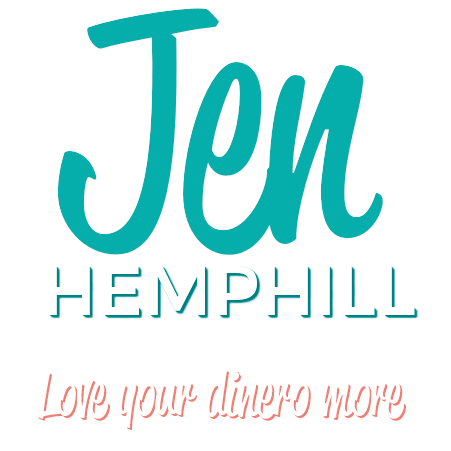 This is Jen Hemphill, your host. I’m so glad you are here with me today. If you see a change in my voice, well you are correct as I am going through a cycle of a cold. 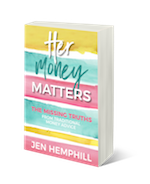 I am excited to share with you that our Her Money Matters community continues to grow and the conversations, the support, the sharing that is going on there is so fantastic. So if you have not joined, I invite you to join us. It’s free and you can go to Jenhemphill.com/community. Today, our guest, I’m really pumped to have her on our show. So naturally when a team member of the US Treasury reached out to me with their interest of being a part of this podcast, I was humbled. I mean think about it, the US Treasury team member personally e-mailing me. Now that was a surreal moment for you. Now, take a moment to think about what is the first thing that you think when someone says US Treasury? Chances are that you are thinking dollar bills. That’s what we normally think of but the reality is, that within the US Treasury, there’s a broader scope to what they do and that we as consumers don’t necessarily know about. So that’s my mission today is to share that with you along with my guest so that way, you get to know another piece of the US Treasury beyond the dollar bills and to get to know more personally a senior official of the US treasury. So let’s talk about what you are going to learn in today’s episode. You’re going to learn her background and why her path took her all the way to serving as a senior official and also the influence that her sons had over this and the one characteristic your personal finance system should have, you’re also going to learn about the number one reason behind the launching of the myRA, what it is and who it is for. And the behind the scenes insight as to what we can be looking out for from the US Treasury next. So let me share with you a little bit about Miss Melissa Koide. Melissa Koide joined the US Treasury Department to serve as the deputy assistant secretary responsible for matters concerning consumer policy. Her office develops and coordinates the treasury department’s legislative and regulatory policies as they relate to retail financial services offered by banks and non-bank financial services companies. In addition to leading the treasury’s consumer policy agenda, Miss Koide leads the treasury’s efforts to examine emerging trends in financial services and growing use of technology and data in financial services. Miss Koide supports the secretary in his leadership in the financial literacy and education commission and she is the executive director for the President’s advisory council on financial capability for young Americans. Most recently, Miss Koide was the vice-president of policy at the Center for Financial Services Innovation which she established and led the organizations Washington DC policy office. So I am excited to introduce Miss Melissa Koide. 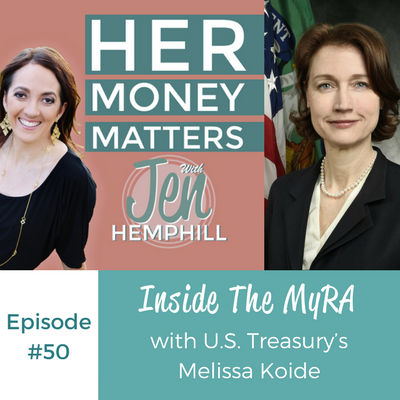 [00:04:15.2] JH: Welcome Melissa Koide to the Her Money Matters Podcast. I can’t express enough how thrilled I am to have you here. [00:04:23.4] MK: It is a pleasure to join you and everybody who will be listening to this. I have to say this is my first podcast so I am probably even more excited to join you. [00:04:34.8] JH: Well that is exciting and I have to say, it is an honor for me because you are representing the US Treasury and to me personally, it just means a lot that the US Treasury is interested in talking more closely to the people and I know there’s a lot that goes on behind the scenes there, but some of us really are aware what the US Treasury fully does. So I think it’s great that you’re going to give us a little scope into that. So I’m excited to do that. [00:05:02.8] MK: No and I think that we really need these opportunities to tell people what we’re doing. Sometimes it’s rather obtuse and we are doing a lot of different both policy and programmatic efforts around really helping individuals and families better manage their money. So it’s great to be a part of this conversation with you and share about something that we are really excited we’ve just announced but I will say that one when we get a little further. [00:05:32.6] JH: Yes, so I am excited because I’m all about talking about money and getting better with managing it and being confident with it so perfect. Let’s go ahead and get started, I would love to know a little bit about you and how you grew up around money. So you’re personal money story. [00:05:52.7] MK: Sure, so I came to this position really focused on consumer financial services and after, gosh, it’s probably been 15 even 20 years since I started working in policy where very early on, my first job out of college was working for the mayor in Louisville, Kentucky which is where I am from and we were solely focused on how are we helping young people in the city of Louisville, especially young kids who are growing up without a lot of money, without a lot of resources. How are we helping them get a leg up and really get the opportunity to get a good education, get to college and really kick off with a solid first job that would help them earn the income necessary to build their own financial resiliency for the long term and one thing led to another, as is often the case. One job led to another and I ended up coming here to Washington DC. In fact, I had worked with the treasury department many years ago and continued to stay focused on this really important need of helping young people and families, especially more disadvantaged families, get the opportunities to build their financial resiliency, to build their savings and ultimately start to build their long term wealth opportunities. So it’s near and dear to my heart. It’s been something that I have been working on for a long time and frankly, it’s also what makes me really excited about what we’ve been doing here at the treasury. [00:07:36.7] JH: Love it and what do you feel struck your interest in this area of personal finance and the consumer policy? [00:07:46.6] MK: I think what really strikes my interest and I have to say, I sort of see it in my own household with my own kids. I’ve got three young sons, twins who are 11 and an eight year old, it’s just how much really when we start to talk about finances and money and making decisions about needs versus wants. The earlier we start with kids and introducing not only the concepts or the big ideas but the opportunities to exercise, making those kinds of decisions and judgements, it really does start to shape how they think about it and even managing something as little as their allowance. So you heard me say that my career has been focused on this for the long term, over the past 11 years, I have also been able to bring that home really to the experiences that my kids are getting and it’s a lot of fun. It’s really a way I think to make sure that we’re engaging with our kids and teaching them the lessons to get them started on a solid financial footing for the longer term. [00:08:56.1] JH: That’s great because you’ve got to definitely take advantage of those money teachable moments and conversations out and about, whatever it maybe because they just soak so much stuff in. [00:09:08.5] MK: They really do. [00:09:09.2] JH: It’s amazing. And tell me a little bit about with your experience because you’ve had a great experience and background, what do you feel is the kind of system that best works for people who are wanting to manage that personal finance better? [00:09:25.7] MK: So I love this question because we spend a lot of time thinking about what does make the difference in somebody, an individual or a head of a household and their level of financial stability and resiliency versus somebody in a very comparable position who maybe isn’t as stable and there probably should be more research on this topic than there is so far. But one of the things that I have picked up and I’ve heard others in the world of consumer finance talk about this. A key difference seems to be it’s actually what you have in your question. It seems to be whether or not an individual or a head of a household actually has a system. It doesn’t have to be a particular system, but it really is about having a system or maybe a little more accessible way to say it, having a routine for how you pay attention to your finances. For some, it maybe just very meticulously balancing the checkbook on a weekly basis. For others, it may be using some of this online personal financial management tools but I think it really is about the dedication to whatever that system is that works for you that gets you routinely thinking about your money and it’s importantly thinking about your short term financial decisions that you’re making but also really having a system that brings you to think about what are your medium and your long term aspirations, and routinely using that system. So I like that question. It was a little bit of an “aha” when somebody at a conference I was attending made that point. The difference just seems to be those who have those systems and those who don’t and I frankly, once again, thought about my own personal finances and realized, yeah this is in many ways about just having that means of staying attentive to my money. [00:11:31.7] JH: Right and you said a key point that I love, absolutely love, is what works for the individual. Because as we know, personal finance is just personal. It’s unique, and what I love about speaking with the women that I speak to such as yourself and then hearing them talk about how they particularly manage the money, it’s a little different. Yes, some use spreadsheets, some use apps, some just use a traditional pencil and paper but it’s a system that has worked for them and if it works continue using it. [00:12:05.8] MK: Yeah, that’s right. That’s right. That’s exactly right. [00:12:09.8] JH: So I would love to know more about the myRA and what it is? [00:12:15.6] MK: Absolutely. Well I am happy to share information about our myRA — myRA is a new pre-retirement savings product that we, the US Treasury Department, developed and launched late last year and the big punchline is, after a number of years of research the treasury was doing to really understand what are the savings needs of Americans across this country? And I mean real research going out, interviewing, collecting information. We realized that there are millions of Americans who want and would benefit from an accessible, simple, safe, and affordable starter retirement account that will help them get on the road to building their long term financial resiliency. I could go on but you keep asking and I’ll give you more of the details. [00:13:20.2] JH: Sure, so it’s simple, it’s safe, easy to start up with, are some of the key things that I’m getting here. So who exactly do you see this to be for? [00:13:35.2] MK: So very good question. This product is designed especially with the 40 million Americans who are working, who are earning income or their households are earning income and I know that’s especially important for your audience, but they may not have access to have an employer sponsored retirement plan. So there are a lot of people in this country and frankly, the numbers are growing whereby people are working for one employer or multiple employers. They may be transitioning from one job to the next, a lot more frequently than we saw say 50 years ago and the ability and actually the obligation really to start to build retirement savings or just even money for the long term, really is dependent on that individual in making those choices and making those decisions and finding the products that enable them to do that. So, what we realized, we the Federal Government is that we can basically, using our own authorities, build a starter retirement plan or a starter retirement account that people who otherwise don’t have access to a retirement account can start to build some savings and build it up to a certain amount, to a certain threshold and then they will have enough money that they can then, we hope without fees and other additional expenses, be rolled over into the private sector where those monies that they’d been saving can continue to grow and really grow at a rate that enables them to be sure footed financially in their later years. [00:15:35.6] JH: Okay, so it’s a place to start with but not a permanent solution. [00:15:41.6] MK: Yes and I think that’s really important. This is a product, which frankly compared to savings rates in the market overall, the earnings on this are quite a bit higher. The past couple of years, it’s been two and a half to a little over 3% APY. So that’s actually pretty notable compared to your traditional savings account rates, one percent or less. But we all know and it’s important for your listeners to know that kind of return isn’t what’s going to ensure whatever your vision of retirement looks like. This isn’t necessarily going to get you there but this is definitely going to get you on the road to be in a position where frankly the market is going to want to be to offer you at these in option and you’ll be able to then grow and invest. I think one of the important things to call out about myRA is we say that it’s simple and it’s safe. It’s safe that it is principle protected. So in this account, you’re not going to be losing money. Your principle is protected whereas when you do get to the point where you are investing in the market you obviously are taking the risks that come within the investment of the market. [00:17:02.6] JH: Right and there is a max that you can put in the myRA correct? [00:17:08.0] MK: You mean in total? [00:17:11.3] JH: In total, yes. [00:17:12.6] MK: Yeah, so our intention is that people will be able to contribute the number that we have been working with is up to $15,000 and then you will be, we expect rolling over into the private sector. You could be rolling your monies into the private sector before that. There is no prohibition on rolling your myRA over earlier but what we’re trying to do is really serve is that bridge right? Between the people who want to save but who don’t feel that they don’t have enough money to save, who may feel constrained, who may want something that’s a little safer before they make a big move into an investment product, and IRA or something else. Really to give them the ability to start to slowly build that savings. One of the other advantages of myRA is there’s no minimum contributions and meaning you can put in as little as $5 a week or a month. You can contribute according to whatever sort of fits your particular budget needs and it’s a way to help people really start to begin to build that savings habit and to see the value and the benefits and the growth that comes when you start to build savings for the long term. [00:18:35.4] MK: So you can see the advantages of something like this, especially for young people. Especially for young people who don’t have an employer sponsor plan. [00:18:45.2] JH: Right, definitely. I can see that, and I was reading there that there are some stipulations because you mentioned you have to be employed. But what about, I’m thinking of stay at home moms, I am thinking of military spouses or the spouses of those ex-pats or the DOD? Would they qualify because they’re not going to necessarily have the income? [00:19:11.7] JH: So how does that work? [00:19:12.5] MK: Absolutely. They do qualify, and I’m really glad you’re asking that question. If you file a joint return and have earned income and don’t exceed the annual income limits and those are the Roth IRA limits, I can give you those in just a second, then you and your spouse can both save in separate myRA accounts. So if you are a mom who stays home, works from home as I like to say, and you have a spouse who’s earning income and you all are filing jointly, the mom herself can actually open an myRA and start to make contributions into it. It also doesn’t matter which spouse earns the income. The dad who’s staying at home can also open a myRA. [00:20:00.0] JH: Right, right. Yeah this also applies to that for sure and tell us a little bit about the difference between the myRA and an IRA? [00:20:09.2] MK: Great question. So we have designed the myRA account to basically comply with the Roth IRA rules and the main difference here is it’s post tax, meaning your contributions to your myRA follow the Roth IRA rules and you’re putting money in after you’ve paid taxes on your income versus pre-tax, which is a traditional IRA structure. The benefits of that are, and I think this is something that’s really important for your listeners too, is the monies that you were contributing to myRA are essentially accessible to you, the contributions that you’ve made. You can use those. You might have shorter term savings or emergency needs where you need to turn to something, right? There is a leak in the roof and you need resources to turn to, you can basically draw upon your contributions without the tax penalties that you would otherwise get if you were saving in a traditional IRA product. [00:21:20.8] JH: Okay, all right perfect and if you have an IRA because I am trying to say IRA and myRA, I feel like I’m about to say the same thing twice, so if you have an IRA, you can still qualify for the myRA? [00:21:37.9] MK: Yes, you can still qualify. Your limitations here are on your broad limitations in terms of annual contributions to an IRA so if you are under age 50, you can contribute up to $5,500 in an IRA or a Roth IRA, which includes the myRA and if you’re over 50, you can contribute annually up to $6,500. [00:22:11.7] MK: I don’t want to lose your listeners, but it’s also important for somebody to check out the myRA because there are the benefits too depending upon your income of tax deductions for contributing to these types of retirement plans. [00:22:32.5] JH: Yes and I’ll definitely be sure to include a link to that in the show notes. So they can check that out because the website was designed very well. It’s easy to follow, I felt. Easy to read through and understand everything. I think it was laid out very well. [00:22:49.3] MK: Great. Well that’s great feedback. I will definitely pass that onto the team. We spent a lot of time on that website. [00:22:55.7] JH: I bet, well it’s a lot especially when you’re trying to communicate to an audience. There’s just so much that goes into the site, what you want to communicate, how it should be communicated so you can relay a message that you want to relay. So I think you all did a good job. [00:23:13.4] MK: Oh that’s nice to hear. Thank you for that, that’s great. [00:23:16.1] JH: And this has been great, I know like I mentioned at the beginning when we think of the US Treasury we don’t really know what goes on behind the scenes necessarily. We think of bills, we think of currency and all of that so this has been a great education as to there’s other things that goes on in the US Treasury so this is great. This is great to know. [00:23:40.9] MK: We do more than issue our notes. [00:23:45.0] JH: Yes and this is just a small piece of what you shared because I’m sure there’s a whole lot that goes on that the podcast would be very long if we shared all of that. So tell us, is there anything else that we can be on the lookout for in the near future from the US Treasury? [00:24:01.5] MK: Well, I’m afraid this news has already been spilled but I’ll go ahead and share it anyway. In fact, I think this was garnering more attention than anything else we might have been talking about but we have decided who will be the prominent woman who will be featured on the 20. Punchline, you’ve probably heard this already but we’re really excited. Secretary Lew has decided that we’re going to feature Harriet Tubman on the $20 note and it is awesome right? I mean we women, we lead our households, we think a lot about money so isn’t it about time we have a really important woman from our history featured on our money? So we’re quite excited about that and then we are going to be featuring a number of other prominent women on some of the other notes as well. [00:24:57.8] JH: So is there a whole process? I mean you don’t have to go into full detail, I was just curious of how it’s decided who goes on. I’m sure it is huge elaborate process possibly, I don’t know. I’m just curious. [00:25:12.1] MK: No, it’s a great question and I will tell you, I work here in the treasury department and basically a part of the policy team and this has to have been the tightest secrecy around who ultimately is going to be featured on our notes. So yes, there is a big process around it but it is a small team who’s really thinking those things through. So I wish I could tell you more but yeah, it was quite exciting around here when we finally all heard who was going to be featured but there’s a website I want to share too with you, one on our currency. If people are interested in learning more, there in fact there might be more about the process, they can go to Modernmoney.treasury.gov. Then of course on myRA product, we really encourage people to check it out, enrol and that website is Myra.gov. [00:26:26.6] JH: Perfect and like I said, I’ll make sure to link that up in the show notes so that way, it’s easy to go click and go to those sites. This has been fabulous Melissa, I’m really excited. [00:26:37.6] MK: Yeah, I’m happy to do it. [00:26:38.5] JH: I celebrate you as well as a woman in the position that you’re in and making an impact. So I want to compliment you and celebrate you because from one woman to another, I love seeing woman in those positions so it’s great. [00:26:52.4] MK: You too and kudos to you for doing this cast. I mean it’s good information and I know a lot of people get a lot of value from it so thank you for doing it. Keep it up no matter where your feet are landing, right? [00:27:08.6] JH: Right, that’s why I do this. It is something that I can take with me for sure. [00:27:13.0] MK: And be sure to open a myRA. [00:27:16.2] JH: I know right and Melissa, as you know this podcast is all about making money simple and taking control of it. So how would you finish this sentence: Her money matters because _____. [00:27:29.4] MK: Oh, her money matters because she, the we, the women are frankly so often the decision makers, right? We’re the ones who are planning for the short term, planning for the long term, and I think making sure that we women are informed and empowered with respect to our money makes all the difference for us and for our kids and future generations. So it almost goes without saying in my mind we all really need to be able to know and take control of our finances. [00:28:07.3] JH: I agree. Well that is great. Fabulous. Again, I really appreciate it. It’s been an honor talking with you today and thank you so much for taking time out of your busy schedule to chat with me and to the Her Money Matters listeners. [00:28:22.6] MK: Super, great talking to you too. Thank you. It’s been a pleasure. [00:28:26.9] JH: So what did you think? Good stuff, right? If the myRA, as you were listening to Miss Melissa Koide speak, if it struck a chord meaning you know this is something that could be useful for you, maybe you haven’t started saving for retirement, and this could be the tool for you. Check it out. There will be a link for that in the show notes. Now, I don’t know if you’ve noticed but throughout the interview she used the term financial resiliency. So I want to talk about it in a little bit but before we do that, I want to give a quick shout out to Miltonia. She is one of our listeners and she’s also a part of the Her Money Matters community over on Facebook. I have to tell you, she has jumped in, supported members of our community and she’s really working hard on her own journey to paying off her debt. So Miltonia, thanks for being a part of the community. I want to remind you that you aren’t alone. Keep doing what you need to do to keep yourself motivated and in action and we are here for you. So let’s talk about financial resilience. It is the ability to withstand events that impact one’s income and or assets. These events can be unemployment, divorce, disability, health problems and they all affect us differently, right? So I wanted to talk about it because as we know, we are all handed different cards and it is up to us, not only how we play those cards but how we react to those cards and how we take care of them too. In Episode 44, there were three words that I said that really struck a chord with many of you and these three words were confidence, patience, flexibility and if you think about it, this is a part of this financial resiliency. When life throws you a curve ball, when something happens, you need confidence, you also need that patience to get through it, you need that flexibility to be able to do, maybe adapt, maybe change something in your life to get through those tough times, right? So you need those three things. This is what’s going to get you through this moment. Through these hard times so you can get to your end goal so you have to make sure that you build and maintain your confidence. That you figure out, if you’re not necessarily a patient person, that you have to do some soul searching and figure out how to build that patience. If you’re not so flexible, you’ve got to again, do some soul searching and learn how to become more flexible. That will help you reach that end goal of that financial goals and get through those hard times and be what’s called financially resilient, right? Next week, we will have another guest. A certified financial planner and she will be sharing her thoughts on what a good retirement cushion looks like and so much more so be sure to tune in for that one next Thursday for Episode 51. That is crazy to me, Episode 51, wow. So that is a wrap for today. I want to thank Miss Melissa Koide for being on the show. I want to thank the US Treasury team and the myRA team as well because it took a whole team to make this happen. So I really appreciate all of you for making this happen and for Melissa, just for sharing all your knowledge and the valuable information. For the rest of you, make sure that you check out the show notes, that way you will be able to find out more about what the myRA is and there is another link she mentioned as well so you can check that out at Jenhemphill.com/50. So thanks again so much for joining me today and I’ll talk to you next Thursday. Loved this episode!! Thank you, Jen! So glad to hear that Deisy. Curious, what resonated with you the most? Thanks for listening!